Powerful means uncomfortable? With the Oxi QC you don't have to compromise. The Ocun Oxi QC is an advanced shoe that excels on all hard routes. An ultra-thin midsole provides the maximum amount of flexibility for toe-hooking and sensitivity on hard boulder routes with imperceptible footholds. Toe-hooking ability is enhanced through a large piece of high-friction rubber placed along the toe area. Grippin' Sticky rubber is Ocun's maximum friction compound designed for polished footholds and sticking onto the kind of tiny holds found on advanced boulder problems. This is doubled with the downturned profile and highly asymmetric last which provide power and precision on anything steep and minute. 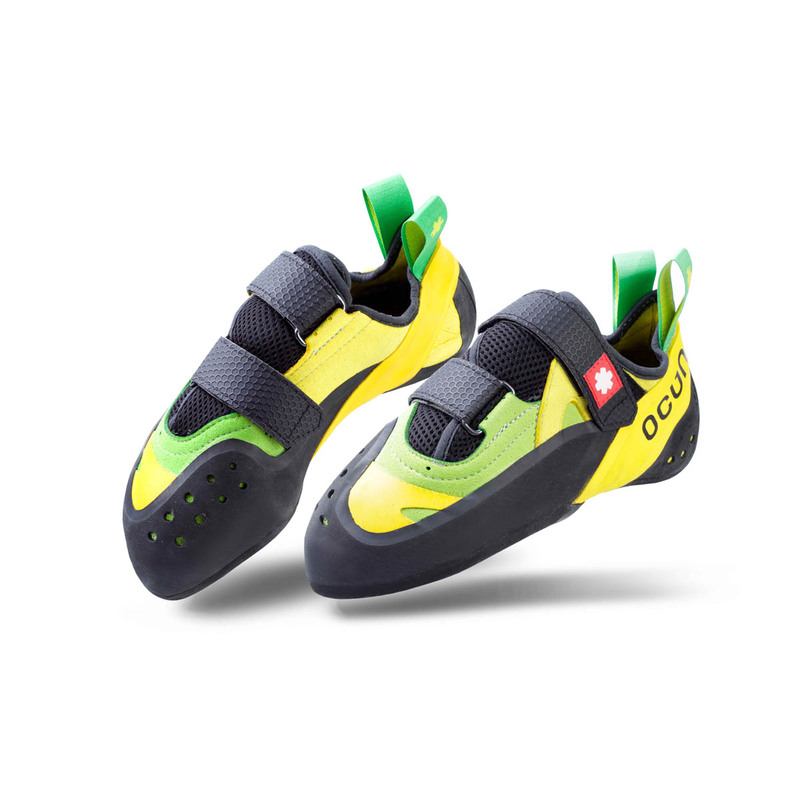 The single velcro closure makes it easy to slip on and off in between climbs, and the microfibre upper means the Oxi QC requires no breaking in and will keep the same performance over its entire lifespan. The Oxi QC is ideal for all high-performance sport climbers and boulderers seeking an easy to wear shoe that still performs on the rock. • Highly rubberised toe-box allow for technical toe-hooks on any surface. I bought these for bouldering and red pointing at the wall. I followed the sizing guide, which turned out to be correct as they really don't stretch tooo much, so becareful if you want comfort verses that little bit of extra performance. I love the positive heel hook in them and positive edging. I think they should smear a little better than they do at present after some more wear. I didn't really buy them for that quality so it's not really an issue. I would be happy to use them outside on steeper routes.great value too. These are definitely shoes I would recommend for most types of climbing, I use mine for indoor sports routes and bouldering and they perform perfectly. I’d even go as far as saying they are the best shoes I’ve bought. The price is great and the quality is top draw. Only issue I had was the sizing, I went for what they remembered but I had to send back and I replaced with half a size bigger than what was recommended and now they are superb. Je me suis tournée vers la marque Ocun connaissant déjà ma pointure et ayant été satisfaite de ma paire précédente. Je possède un pied fin. Rien à reprocher au chaussons pour l'instant, j'ai pu les essayer dans divers profils en SAE et j'en ai été très satisfaite. L’adhérence est excellente, le chausson prend vraiment la forme du pied et le tissu intérieur est très confortable. Le talon est également irréprochable. Le système de scratchs inversés est très efficace et le pied est bien serré sans points douloureux. Reste à voir leur usure dans le temps, mais pour le modèle précédent, celle ci était tout a fait acceptable. Bonne grimpe !